Are you planning to take a trip to see family this holiday season? If so, we hope you've thought ahead. There are many ways to make your trip a better one. The travel experts suggest avoiding peak travel dates, getting familiar with the airports you'll be traveling through, buying your tickets well in advance, packing your luggage according to TSA guidelines, and leaving early on the day you're going to be traveling. Along with these great ideas, we hope you'll also consider the following bed bug tips. Bed bug eggs. The eggs left by female bed bugs are about 1 mm in size, white in color, and usually, have a shine to them. They may be alone or in a batch. And will usually be found with black droppings or shed insect skins, if they are in an area of infestation. Bed bug nymphs. When bed bugs first hatch, they are around 1 mm in size, pale, and transparent, with six legs, two antennae, and three body parts. As they develop, they become more tan and eventually appear brownish red. Bed bugs do not have a larval stage, so they have the same shape in all stages of development. Adult bed bugs. Bed bugs pass through 5 instars. Once they reach their adult stage of development, they are a dark brown color. In this stage, it is easier to see the horizontal creases on their abdomen. Fed bugs. The appearance of a bed bug can change if it has had a blood meal. Its abdomen will fill up with blood and become bloated. This changes the bug from a flat oval to more of a pill shape, and the color of the blood will be seen through the skin of the abdomen. For newly hatched bed bugs, this can make the abdomen appear a bright red. It is possible to see a bed bug at any point along your journey. These bugs can appear in buses, trains, planes, and other forms of public transportation. They can show up in hotels, motels, and other places you may spend the night. They can even be in the home of a friend or relative. No matter where you are, it is important to know where bed bugs like to hide. Creases. Bed bugs lay their eggs, and hide themselves, in the creases of clothing, pocketbooks, luggage, and more. The tighter, the better. If you're sitting on a seat in an airplane, take a moment to examine the creases in your seat, and the seat in front of you. Pockets. 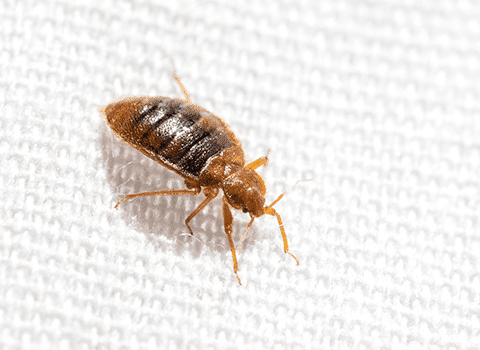 From clothing pockets to seat pockets, bed bugs love them all. These insects prefer to stay hidden. When you open a pocket, no matter where it is, be on the lookout for bed bugs and their eggs. Sockets. While bed bugs can be found in the seams of mattresses and box springs, they also hide in bed frames. If you examine a bed for these bugs, be sure to take a peek into any sockets or holes you see. Crevices. If you inspect a room for bed bugs, be sure to examine baseboards and outlets for black streaks left behind by bed bugs. Laundry. Bed bugs are drawn to items of clothing that have been worn. Stitching. When you examine upholstered furniture, pay close attention to stitching. Keep a watchful eye out for bed bugs in all stages. Always do a bed bug inspection if you stay the night somewhere. Look for eggs, bugs, black patches, black streaks, shed insect skins, and dried blood stains. Never assume there are no bed bugs just because a place is clean. These pests can be found in the cleanest of environments. When you get home, wash all of your clothing on the hottest temperature. This will kill bed bugs in all stages of development. These tips should help you keep those bugs from coming home with you during this holiday travel season. But, if you ever find bed bugs in your New York home, reach out to Thomas Pest Services for immediate assistance. We have developed bed bug control solutions to make sure your home is free of bed bugs in no time at all.
" Responsive, reliable, and professional, everyone has been great to work with. "